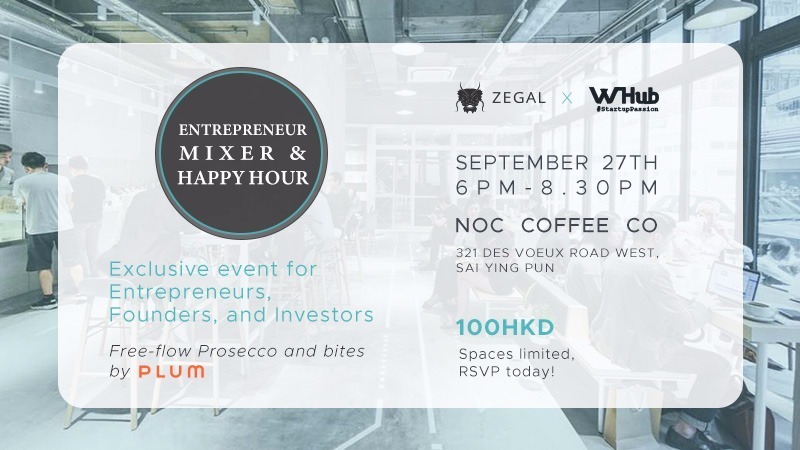 WHub & Zegal have teamed up to host an evening that will bring together the entrepreneur community to meet and connect in an exclusive setting. Expect an intimate setting for interesting conversations with like-minded people who share a passion for innovation and leading Hong Kong’s best startups. Set in the stylish N.O.C Roastery in Sai Ying Pun, enjoy free-flow prosecco and a menu curated by our friends at Plum. Spaces are limited. RSVP now to secure your place. WHub also connects corporates to innovative startups and helps companies in their digital transformation process, through hackathons, startup competitions, workshops, acceleration programs and top executive seminars. And helps entrepreneurs get ready to raise capital, creating employment and building innovation. Last, but not least, WHub creates bridges and leverages partners in other ecosystems to help startups scale beyond their home countries and region. Zegal’s vision is a world where the business of law works for everyone. Companies that are connected to knowledge, their advisors, and use workflows to run their organisation are smarter and more profitable. Our mission is to make this the new normal for millions of businesses across the globe. Zegal is led by a talented team of 60 employees and has offices in Hong Kong, Singapore, Australia, New Zealand and the UK. Zegal (formerly Dragon Law) has been featured in Forbes, Huffington Post and VentureBeat, and was recently recognised in the South China Morning Post as an emerging Legal Tech company in the artificial intelligence space. zegal.com is free to any private practise law firms or sole practitioners on an unlimited basis.